The NCAA Tournament is already helping CBS. 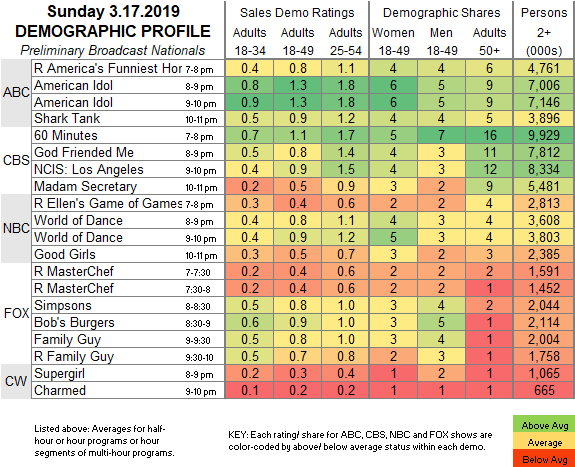 ABC: After 0.8 for an AMERICA’S FUNNIEST HOME VIDEOS rerun, AMERICAN IDOL was steady at 1.3. SHARK TANK gained 0.1 to 0.9. CBS: 60 MINUTES rose 0.3 to 1.1, probably because of its NCAA Brackets lead-in. GOD FRIENDED ME rose 0.2 from last week to 0.8. 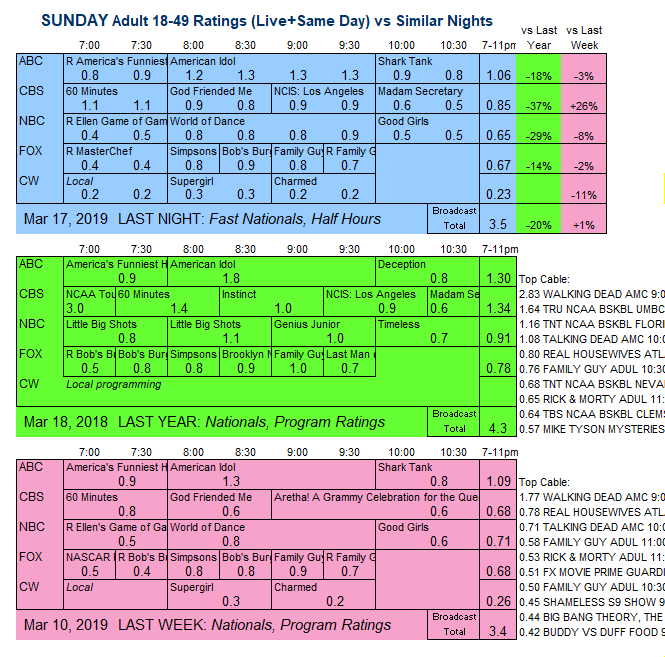 The 9-11PM shows returned from a week off, with NCIS: LA steady at 0.9, and MADAM SECRETARY down 0.1 to 0.5. NBC: The night started with 0.4 for a rerun of ELLEN’S GAME OF GAMES, then WORLD OF DANCE held at 0.8, and GOOD GIRLS lost 0.1 to 0.5. FOX: THE SIMPSONS remained at 0.8, BOB’S BURGERS climbed 0.1 to 0.9, and FAMILY GUY dropped 0.1 to 0.8. The night’s reruns were at 0.4/0.7. Primetime tonight includes the series premiere of ABC’s THE FIX, the midseason return of FOX’s 9-1-1, and the season finale of CW’s BLACK LIGHTNING.